Born June 27, 1926, in Nashville, Tennessee, Ivan Leroy "Little Roy" Wiggins turned to the steel after hearing the Grand Ole Opry's Burt Hutcherson picking the instrument. "He played in the neighborhood at somebody's home and mother and dad took me, and I thought then that it was the prettiest thing I ever heard," recalled Wiggins in 1995. 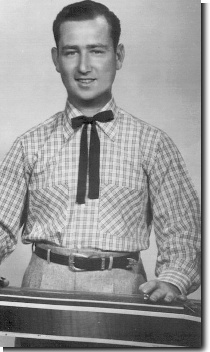 At age 13, he was expert enough on the instrument to join Paul Howard's Arkansas Cotton Pickers on the Opry. Later, he joined Pee Wee King's Golden West Cowboys as a temporary replacement for Clell Summey. When Eddy Arnold left the Golden West Cowboys, he hired Mr. Wiggins for his own band, the Tennessee Plowboys. "Little Roy Wiggins' crying steel guitar was the hallmark of Eddy Arnold's early style, the style that made him country music's biggest star in the late '40s," said country music historian Ronnie Pugh of the Country Music Hall of Fame. "You just can't imagine the early Eddy Arnold sound without that," he said. "It would be like not having Billy Byrd on Ernest Tubb's records." Mr. Wiggins stayed with Arnold for 25 years, providing the "ting-a-ling" sound that distinguished the singer's recordings. "When you heard him play, you knew it was him and you knew it was going to be an Eddy Arnold record," said Grand Ole Opry announcer Eddie Stubbs. "Artists' recordings aren't that easily identified in this era. There's no telling how many people took up the steel guitar as a result of hearing the records Little Roy played on." In the late 1950s Mr. Wiggins made instrumental records for Dot, Starday and several smaller independent labels. He went on to play in the same style with George Morgan, the Willis Brothers, Ernie Ashworth and other Opry acts. In the late 1960s he opened a music store, Little Roy Wiggins' Music City, at 427 Broadway in Nashville, near the Ryman Auditorium. When the Opry moved to Opryland, Wiggins eventually closed his store and moved to Pigeon Forge, Tenn., where he performed for tourists and ran a music shop. Mr. Wiggins was inducted into the Steel Guitar Hall of Fame in St. Louis in 1985. "He inspired a generation of players to pursue the beauty of the smooth, pure melody line," reads Mr. Wiggins' plaque. "A man of character and quiet determination, he viewed 'artful simplicity' as a performer's first virtue for advancing the steel guitar." Country music lost one of its most distinctive sounds with the death of steel guitarist "Little Roy" Wiggins on August 3, 1999.